Losing weight requires you to consume less calories than you burn, but the big problem is you can never know for sure how many calories you’ve burned. The best you can ever do is guess. In today’s podcast we’ll discuss some of the major errors in guessing the amount of calories you’ve burned and we’ll show you how to account for each of these errors. the “NET” effect of exercise vs the GROSS effect. All of these errors contribute to over estimating the amount of calories burned on a daily and weekly basis. It doesn’t take much of an error to add up over time, and if you keep making the same error in your calculations it could be the difference between seeing a big change in your body or just spinning your wheels. You can listen to the podcast or download the transcript. Thanks guys, this is really informative. 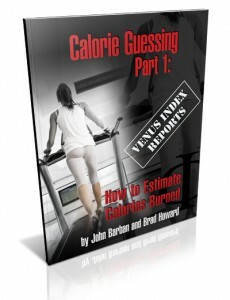 It is actually quite amazing to learn that when we are provided quite definitive numbers and calculations for both calories consumed and calories burned, that there is actually so much variance and guesswork. While I have been aware of this for some time, to actually see the (estimated) size of the variance on the different factors is useful. For the past few years I have kept a massive spreadsheet that has my weekly measures (weight, body fat and inches at different body points), food I have consumed daily with calorie and macronutrient estimates and the exercise programs I have done and their estimated calorie burn. Now I know this is extreme but I am by nature very analytical (PhD in aerospace engineering – yep I am a rocket scientist) and I have been pottering around with studies in nutrition and physical training. I have learnt just how inexact these calorie in and calorie out estimates actually are. On the flip side though, I have been able to use trends to figure out what works for me. Also writing down what I am doing keeps me honest and helps with forward planning of menus and exercise. There are a couple of things that really resonant with me in the podcast. Firstly, I was not aware of the significant influence of organs versus muscle. My initial reaction is that keeping organs running as optimally as possible through providing clean foods and water, limiting inflammatory responses (such as caused by food intolerances), minimising hormonal imbalances (and the dastardly xeno estrogens) and detoxing could be quite powerful. Obviously doing all of the above is good for overall health, but does this have an impact on metabolic rate? Secondly, females, and especially petite females like me, have to really watch portion size. It is really frustrating for me to see my “oversized” husband (6’3″, 210 lb and ~7% body fat) basically eat what he wants, exercise less and get more results than me (5’3″, 108 lb and ~14% body fat). Finally, your point that the last few pounds is really hard to lose. All of us have a predisposition to have that one area where our body just does not want to give up the fat. Any advice on this would be welcome. On another note, despite being fit and lean, I have always aspired to being more athletic looking. I work at it quite hard (even obsessively) but have always looked in the mirror with a jaundiced eye. Anyway, along comes the Venus Index and low and behold my 3 ratios are actually dead on the money. I am that hourglass. So I began thinking about why do I have a such a negative perception of myself? I have come up with a few thoughts. 1) A NCSU study found that the bulk of women come in 4 different body shapes: banana (rectangular shape with a high WHR ie big waists) is 46% of women, pear (small shoulder and waist but big hips) is 20%, apple (upside down triangle) is 14% and an hourglass at 8%. Why is this relevant, because nearly 2/3 of women have a more masculine figure with bigger waists and what appear to be slimmer hips. Guess what, most clothes are cut for these figures, most women we see such as models, actresses and athletes have this figure type. It is hard to feel great when you do not fit the norm and clothes do not fit you. 2) I have always aspired to look more athletic, however most athletes have a body with a larger cross section not a small waist. I think this is in part due to basic physics, more cross section through the core equals more strength and power. I also think that a larger cross section would more easily contain all those organs for a leaner look. Ok so I can now see that I may not have quite the bone structure for the athletic look I aspired to but what I have instead is a ‘god given’ hourglass that is lean and fit, and in the words of my hubby, that is a good deal sexier. So thanks guys for giving me a different way of looking at things. I can relate, I did CFD research on unstart conditions for scramjets back when I was at State… so I “get you”. As far as the stubborn fat, it just takes more time. First on, last off. One other thing you have to realize is that the tolerances you’re used to in the engineering field are very tight. Usually less than 0.1% of unit of measurement. Here, we’re looking at errors of 30% or more across the board, COMPOUNDING. 1. How would the normal person measure it? 3. What lifestyle alterations would that require? 4. Would this increase in metabolism be GOOD? For 1, if you can’t measure it, then you can’t track the response, and then it’s just all based on faith, which then leads the mass public to make more miscalculations, which leads people to think they can safely eat more food. For 2, what type of boost can we get? 10% maybe. what you do in your life in order to get that 10% boost, is it even worth it? Ultimately, would it lead to a longer life? If it leads you to be more anti-social, then I’d say no. For 4, it’s the question no one ever asks: Is having a higher metabolism a GOOD THING? Fat burning, sure. Everyday life… not so much. Higher metabolism means more HEAT release. More sweating and then there’s possible fever and heat stroke. But then what else happens? There are no independent variables in all of this. It’s a system with feedback controls all across the board. You don’t get to turn one knob and only have it affect one thing. This is why drugs have so many side effects. You’ve got a good handle on things and obviously your ratios are great, so there’s no need to complicate things by trying to find out the answer to things that no one really knows about… lol. Well, from one space cadet to another, thanks for the detailed response!!!! I would like to add one more key correlation for a long and healthy life and that is eat more vegetables!!! Actually, you’d be really surprised that food selection seems to have a negligible effect (so far that is, not saying that will change). The magic word, cell waste. This is exactly where my own research has lead me to but the scientific studies are just not there. More on this in a moment. Now I hope you don’t mind another essay from me, but this is the first time I have been able to have a good discussion with anyone regarding the research (or lack of it) and potential drivers of health and longevity. Vegetables!!!!! I think you and I have a difference of opinion here so let me explain my findings and thinking. After reading quite a few studies including the China Study, John Robbins anthropological longevity studies and countless scientific papers, I think is a reasonable correlation (not causation as that is not proven satisfactorily yet) between diet and health / longevity. I have pulled together a bunch of stats across a number of countries that I think show a fairly compelling story. I will freely admit that the stats are not perfect due to different measurement techniques and in some cases it relies on people reporting numbers which is incredibly unreliable. The sources I have used for this are UN, WHO, OECD, Nationmaster, Euromonitor, FAOstat, USDA, Country based census data and country based bureau of stats. I am going to use 3 countries, the US, Japan and Hong Kong (cause this is where I live). Longevity in Japan and HK is 5 to 7 years higher than the US. Healthy lifespan is reported at close to 10 years higher. The % of obese people in HK and Japan is 1/6 of the US and overweight is 1/3. Deaths from heart disease is 30 to 50% lower in HK and Japan, and deaths from cancer is 40 to 50% lower (despite cancer mortality rate being 50% per cancer patient in Japan / HK versus the US at 37%. It is thought is is type of cancer and age that drives this). It can be said that diet is a key driver of the biggest killers, heart disease and cancer (so sayeth the US surgeon general amongst others). So what are the differences in diet? If I roughly normalise for size differences (Japanese and Chinese are smaller than westerners), then Japanese and HK eat about 10 to 12% less calories. They also eat about 10% less protein, so basic maths suggests they eat a similar macronutrient ratio of protein. However the form of protein is very different. In the US protein comes from 70% meat, 12% dairy, 3% fish and 15% plant. Japan and HK are more like 20% meat, 20% fish, 60% plant and 1 to 3 % dairy. HK and Japanese eat about 1/4 of the amount of meat but over 3 times as many vegetables. This also has a flow on effect to fat consumption which is about 40 to 50% lower (and cooking methods differ). HK and Japanese also eat less than half the amount of packaged, process carbs than an American. Additionally, HK and Japanese move more. That is they walk further and undertake more planned exercise. Ok, so these are all high level stats that appear to show a correlation to health and longevity. But the takeout for me is that if I eat more vegetables and less animal protein and processed carbs and move more then I am statistically more likely to be lean and have a longer life. I have recently read a couple of studies (but have no idea where I put them, so we gotta love unsubstantiated factoids) that have come up with the amazing finding that for every 2 serves of veg over the 5 F&V recommendation a person eats, they can expect 2 to 3 years longer life span. Additionally, the recent 7th day adventist megastudy found that “light” omnivores, that is ovo lacto vegetarians and people who eat a little meat (think Japanese and Hongkies), had an increased lifespan of 4.4 years for females and 7.3 years for males when compared to both vegans and normal American meat eaters. This was also found in a set of British longevity studies in the 1990’s. Vegans and meat eaters both have a similar, and shorter life span. However vegans have a healthier lifespan under the age of 65 years (an example is they had 45% less heart attacks). However as they age there is a problem. It seems that not eating carnosine (found in meat) is the a problem. Carnosine prevents a potentially lethal glycation reaction, which is linked to cancer, diabetes, heart disease and Alzheimers. So my takeout is still eat less animal protein (but not necessarily less protein) and more vegetables. So onto cellular waste. I think this is key as if you think about it, how would our cities look if we had no garbage trucks? Disgusting, dirty, disease and death. I have cobbled together some theories, some anecdotal evidence and only a little real science. Currently my thinking is heading towards how the body removes cellular waste from out cells. It uses either the circulatory system or the lymphatic system. It is said (but not verified) that the lymphatic system is responsible for removing animal proteins (both metabolised and excess), fats and toxins. The blood stream does the rest. The lymphatic system is also where out white blood cells, T cells etc hang out and move around the body, so it is key in our immune system. The lymphatic system has no pump (ie no heart) but relies on muscle contractions to move. So no exercise, then a likely slow down in lymphatic function and removal of cellular waste. Also the more animal protein and dairy we eat, the more waste for the lymphatic system to remove (my theory and not in the least verifiable). The more vegetables and plant protein, the less waste to be removed by the lymph. Now if I look at the stats of 50% of females in the west having some form of cystic breast disease and 1/10 getting breast cancer (it is less than half this in Japan and HK) which are impacted by lymphatic system performance and the removal of cellular waste, I start to question what slows the lymphatic system. Could it also be related to the level of obesity given the lymphatic system is required to remove fat. Good question as it seems logical that if the lymphatic system is n0t working then the body is going to store fat and toxins somewhere. Rough anecdotal evidence suggest that constricting the lymphatic system though things such as bras, blocking the lymphatic systems using aluminium based deodorants, eating dairy and higher levels of estrogen (including from our polluted food chain and hormone feed cows) are all causing a problem. I am still getting the take out of eat less animal protein and more vegetables……. that and exercise more. To personalise this, I have had cysts and benign tumours in my lymphatic systems for years (like a lot of women). Anyway, earlier this year this reached a crisis point where I started suffering from lymphodema. I went from being a very active, energetic person to a complete mess who could hardly get out of bed. I was faced with the western medical profession suggesting surgery and the removal of some of my lymphatic system as well as the tumours. NO WAY!!!! I started to have a lot of manual lymphatic drainage work to ease my condition and I started to search for a solution. After reading lots, talking to a naturopath and some friends in medical research I started to think there was a link with dairy and meat. I went back through my massive database of everything I eat and sure enough I had started to eat more meat and dairy (whey for workout nutrition and yoghurt for snacks) in the year previous, and less legumes (I am wheat intolerant so processed carbs are not a problem for me – gluten free just does not exist here in HK) as I had focussed more on lowering body fat and improving athletic performance. So I removed dairy and lowered my meat intake whilst raising the amount of protein I was getting from vegetable sources. In 2 months the two biggest and nastiest tumours are gone, no more lymphodema and I am slowly getting back to the person I used to be. My lymphatic system is working much better. I am not the only woman who has had stunning results using this approach. I typically eat 5 meals / snacks per day. I have swapped out whey powder for sunwarrior vegan protein (although I am going to try the Garden of Life product shortly), got rid or milk, cheese and yoghurt and have meat at only one meal a day, fish several times a week, and have increased the amount of legumes I eat. Amazingly enough over the same 2 month period I have managed to go from 16 to 14% body fat and put on 2 lbs of muscle – and on less meat but a similar level of protein. Now I have no scientific evidence but I believe I have dramatically improved my health, increased my longevity and I look better in my bikini. For some reason, I guess I can’t nest deeper with the comments so we’ll have to start a new thread after this. Okay, first, congrats on all of the successes! Second, I don’t think you’ll find that I (or we) will disagree with much of what you said… as a whole. For example, when you try to restrict calories, no matter the level, you tend to find that veggies get to be something you can consume a lot of. So instead of starting with the “rule” of eat more veggies, it’s more of a consequence… make sense? We always start from the top down and then work a “proof” of why we recommend what we recommend. Next, a few other things to consider. 1. Are lot of the correlations regarding diet due to differences in macronutrient intake or caloric intake as a whole? You have both, and we know restriction gets these results. 2. What are the social and “happiness” factors that differ between measurements? We know stress effects one way and close knit communities effect the other way. This has to be considered. Do you see where I’m going with this? There are a lot of variables and until you can tease all of these out and then focus strictly on diet composition, it’s tough. In other words, if the average person is 30-40 lbs overweight and eats 3000 kcal per day (man I wish we’d move to Joules), would changing the composition of the meal, yet still stay at the same kcal intake help MORE than just taking the volume of calories DOWN, which takes down all of the other “bad stuff” with it. Again, I have no “beef” (pun intended), with what you’ve found for yourself and obviously it’s worked for you. But, for us, its all a 3 step process basically, versus just the one. This is a great question Brad and one I’ve been asking myself lately when I talk with people. I think for your average person when talking about “metabolism” what they are simply getting at is: how can I eat more food without gaining weight? And I think that’s where a lot of the mainstream media types, fitness gurus, etc., go with it (hate to sound conspiratorial but, sounds to me like another tactic to get people to buy food products…). There’s this concept that if you are starting off at 250 pounds and maintaining that while eating 4000 calories a day, then start eating less and get the weight down to a goal weight of 165 but now can only eat 2500 calories a day, somehow it’s your metabolism’s “fault” when you start eating 4000 calories a day again and put the weight back on. No, it’s not your metabolism’s fault, you were just eating way too much to begin with! Not sure if I’m making myself clear but, I think your question that is not being asked is a good one and there needs to be discussion and some clarifications to the masses on what metabolism ACTUALLY means. I don’t think that’s conspiratorial… that’s marketing. You position your product in the best light, using the best benefits to the public so they’ll consume it. There’s MONEY on the line. When you’re 250, your maintenance levels very well COULD be 3000 cals a day, but not from BMR, which is correlated to lean mass, but because you’re having to move around a 250 lb body, which is just physics. So a smaller person is going to have a lower everyday life maintenance level, simply from physics. Less work done. Therefore, when people think that 3000 cals is maintanance and they weren’t “gaining” anymore when they were at 250 eating 3000ish, they think that this is their maintenance levels for 150. Maintenance levels scale up and down with total body weight due to work. THIS is why “crash” diets don’t work. Not because they are bad, but because people don’t get a handle on their new maintenance loads. Thanks guys – interesting stuff, though it was mainly stuff I was aware of already. I just don’t think I’d appreciated how large the margin of error was though. I’d love a podcast on the last 10 pounds please. I’m only 5ft tall too so I end up eating very little and there’s always that constant worry that eating so little for so long will make my body so efficient at using what little it gets that I’ll never be able to eat normally again! Come to think of it, if I could get my body to run on 1000 cals a day, while keeping this amount of muscle, that would RULE!